I was fortunate to visit Death Valley in January 2018, for what turned out to be an epic journey with three photog compadres of mine, Eric Emerson, Michael Heathman and Joe Naccache. I say epic due to the unique weather conditions given to us by Mother Nature. These conditions provided us with photo opportunities that were indeed rarely seen in these parts of California. First, some interesting background information from an earlier blog post of mine, some two years ago, 'My Favorite Places in Death Valley National Park ~ January 2016. The valley received its English name in 1849 during the California Gold Rush. It was called Death Valley by prospectors and others who sought to cross the valley on their way to the gold fields. Even though, only one of the group died here, they all assumed that this valley would be their grave. They were rescued, and as the party climbed out of the valley over the Panamint Mountains, one of the men turned, looked back, and said "goodbye, Death Valley." During the 1850s, gold and silver were extracted in the valley. In the 1880s, borax was discovered and extracted by mule-drawn wagons. The depth and shape of Death Valley influences its summer temperatures. The clear, dry air and sparse plant cover allow sunlight to heat the desert surface. Summer nights provide little relief as overnight lows may only dip into the 82 to 98 °F (28 to 37 °C) range. Moving masses of superheated air blow through the valley creating extremely high temperatures. On the afternoon of July 10, 1913, the United States Weather Bureau recorded a high temperature of 134 °F (56.7 °C) at Greenland Ranch (now Furnace Creek) in Death Valley. This temperature stands as the highest ambient air temperature ever recorded at the surface of the Earth. We put this photo shoot on our calendars in early November 2017. Of course at that time it was nearly impossible to predict with any accuracy what weather conditions we may experience in early January 2018. I have been a photographer long enough to know, when it comes to weather on a photo shoot, 'You get what you get'. However, when I checked for the weather predictions a few days before our journey began, the forecasts predicted rain. I have never experienced rain in Death Valley. Not surprising considering the area receives, on average, less than 2 inches of rain annually. However, my 'audacity of hope' was that I would be happy to experience any forms of weather that provided us with clouds, again a somewhat rarity, but always welcome by landscape photographers! What we were given by Mother Nature was a lot more than any of us expected! We drove into Death Valley on January 8th, and with heavy grey skies, it rained all day. The following morning we headed out for a sunrise shoot in Mesquite Flat Sand Dunes, with sunrise set for 7:00pm. What we discovered in the dunes area, located close to Stovepipe Wells, was heavy grey skies and no sunlight to provide any highlights. We had breakfast at Stovepipe Wells and drove home with no photography possible due to the dull conditions. Sometime late that afternoon sections of the skies bagan to open up, and we headed out to Zabriskie Point to find beautiful light and clouds making for good photographic conditions. The above is the classic view from Zabriskie Point, named after Christian Brevoort Zabriskie, vice-president and general manager of the Pacific Coast Borax Company in the early 20th century. The most prominent feature is the arrowhead shaped Manly Beacon to the right, and the textures and color contrasts of the eroded rock common in this area. Manly Beacon was named in honor of William Lewis Manly, who co-guided the ill-fated Forty-Niners out of Death Valley during the gold rush of 1849. The above is the beautiful rock formation, looking south from Zabriskie Point, with this image showing the setting sun light, along with a layer of low lying fog that completely covered the area just after this was shot. We left this area happy to be out shooting for the first time since we arrived, and headed out to scout the conditions of Badwater Basin, and the possibility of standing water in the area due to the recent rains that could provide an opportunity for reflections at sunset. The next morning we awoke early and headed out to photograph the sand dunes located close to Stovepipe Wells, the other major location with accommodations and restaurants in Death Valley. From the time we first stepped out of our hotel rooms in Furnace Creek we could not see a clear sky - no visible stars. Not a good sign for a sunrise shoot on the dunes. The farther we drove the more we realized that there would be no sunrise shoot this morning. The reason for the no shoot - heavy fog! I had never seen fog in this area in the many time I have visited Death Valley. Here is an iPhone shot of the General Store in Stovepipe Wells, just after the sun had risen for the day. That day I asked every local person that we met if they had ever seen fog in Death Valley in all the time that they had lived in the area. Not one person that I spoke to had ever seen fog before in the area. The weather continued to be overcast with dense cloud cover, again not conducive to photography on the dunes, because without sunlight there are no highlights and the sand look very monochromatic and dull. However, in the afternoon the clouds began to thin and disperse so we headed back to dunes hoping for a little more light to make a sunset shoot possible. 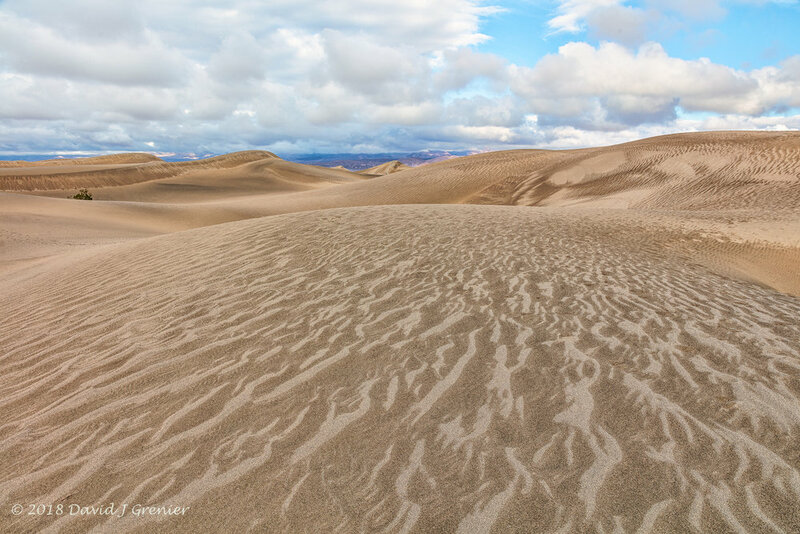 We have found through experience that the highest and most dramatic dunes are the ones located nearest to the visitor parking lot near Stovepipe Wells. However, these dunes are also the most traversed by visitors, and consequentially, the dunes are marred with hundreds, if not thousands, of footsteps, not exactly attractive in any composition for a photographer. Nevertheless, we all wanted to go out on the dunes for sunset and picked a place to enter the area someways farther down from the visitor parking lot, hoping that the area would be less marked by footprints. I am including an image of the largest dunes in the area, just to give someone who has never been there an idea of what the big dunes look like, as well as the ever present footprints. If you can enlarge this image enough, you will see people standing on the top ridges of the dunes that will give you some perspective of the enormity of these magnificent structures. On this day, a first time for me, we walked out into these dunes after a little less that half an inch had fallen over two days. A relatively unusual amount of rain considering that Death valley has an annual rainfall of less than 2 inches per year. When we first began walking on the dunes, the sand, wet from the recent rainfall, had a completely different look and feel to it than I had ever seen previously. It was easier to walk on, as the dampness made it more stable. 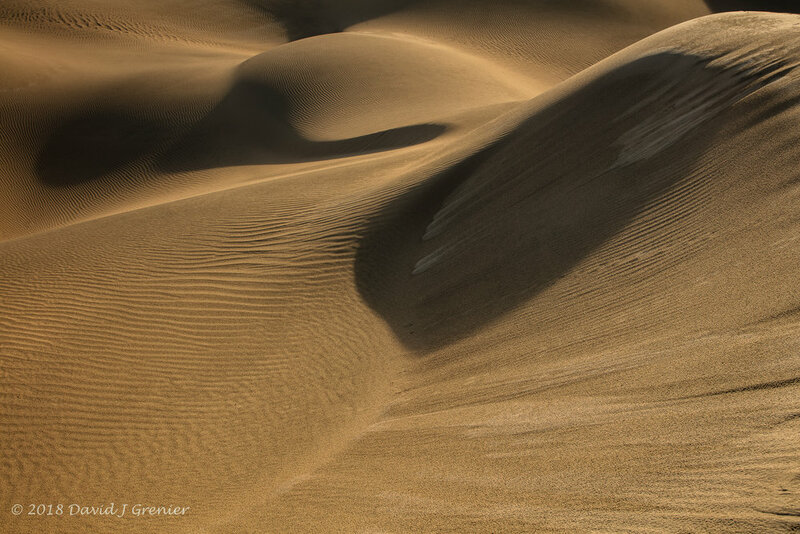 The image above shows what the sand looked like, and we were all happy to be out photographing the dunes finally! Here is another image below, similar to the first, but with no people and the footprints removed. And finally, I will leave you with an image that I really liked, albeit abstract, that shows the sheer beauty of these dunes when direct sunlight is available, the beautiful shadows and light that are created are simply a delight to photograph! I left this evening hoping that we would have an opportunity to shoot a sunrise on the dunes the next morning. This is my favorite time to photograph the dunes. You walk out in the dark to find a position that you can shoot from when the sun rises and the first low light hits the sand. The transformation that occurs of the dunes is simply magical, something that I have experienced previously on many occasions, and one that I wanted to experience again. Before I show you the images from our sunrise shoot on January 11, I thought I would show you a couple of images that I shot in Badwater Basin, the other significant photographic location in Death Valley. Badwater Basin is an endorheic basin in Death Valley National Park, noted as the lowest point in North America, with a depth of 282 ft (86 m) below sea level. My iPhone compass screen grab shows a -280 ft Elevation, missing the lowest point by 2 feet! Mount Whitney, the highest point in the contiguous 48 United States, is only 84.6 miles (136 km) to the northwest. Badwater contains rusty salt formations, that we were hoping would contain water from the recent rains, and that water can then form a reflective surface, that is ideal to reflect the colors of a setting sun over the Panimont Range. Having scouted out the area previously, we knew where the water was, and how to get to the best location. It consisted of walking out from the main designated parking area for approximately 30 minutes. We tried a location that would have been a shorter trek out, but discovered that we had to walk through heavy mud - shorter, but damn near impossible to get through. Here are a couple of images of a sunset that was captured on our last evening in Death Valley. I was getting set up prior to sunset when this young lady walked through, normally a 'you're in my shot moment' but I embraced the moment and took this shot anyway. One that gives a perspective and adds a sense of motion to an otherwise stagnet image. The sunset shot that I was happy with, pointing in the same northerly direction as the previous image. And now, on to what I consider the highlight of our trip - the sunrise shoot on January 11, 2018 at the Mesquite Flat Sand Dunes. Again, we awoke up at 5:15am and headed out to the dunes, feeling encouraged that when we walked out of our hotel rooms we were greeted by the sight of stars in the sky. This meant we had clear skies, and we would have the soft, low, morning light on the dunes, and we would finally have a good photo shoot on the dunes. Little did we know how good! When we had been out on the dunes the previous evening and run into lots of footprints, we decided to try an area further away, albeit one that none of us had explored, let alone photographed previously. Not the smartest thing to do, one could argue down right risky, going into an area that you have never shot previously in the dark! On the way there, it became obvious that while we may have had clear skies when we left, the dunes area was covered in a low lying fog, caused by evaporation of the previous days rains. Here are a couple of images below of us walking out in the fog headed to the dunes, as well as setting up our tripods at the dunes when we first arrived and the visibility was very limited. This morning we were given a show by Mother Nature that was simply epic, and one that not many people have seen before - fog in the Mesquite Flat Dunes in Death Valley. There was a brief time when I did not think that the sun would burn off the fog enough for us to capture anything meaningful. This is a time when you are glad to have been completely wrong! The following are a handful of images from that morning that I consider to be my favorites. 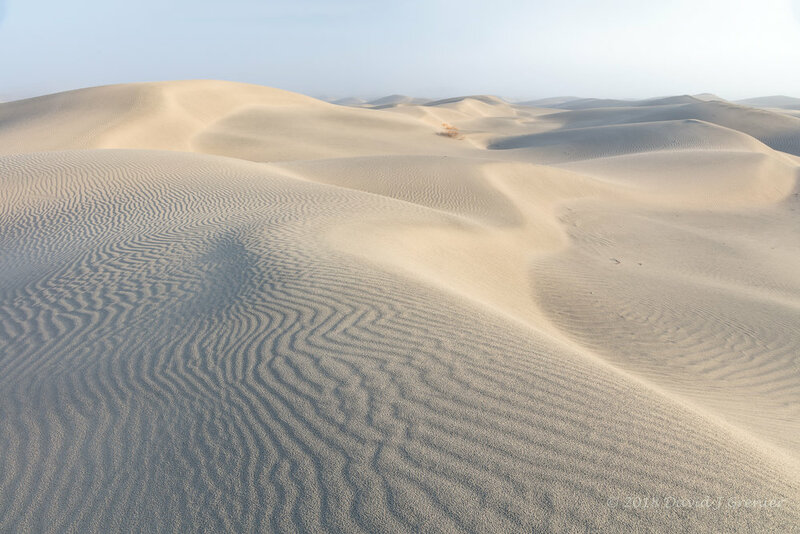 One of the first images shot before the sun burnt through, the beautiful flowing lines of pristine dunes in the fog. I could go on, adding one more, and then one more, but have chosen to give you some highlights of this magnificent morning that we were thrilled to have experienced. I decided to do very little development of these images to reflect the soft moody light that we experienced that morning. It was a gentle, low filtered light, and highlighted the markings in the sand, that was beautiful to experience, as well as view and photograph. A special morning in the Mesquite Flat Sand Dunes, Death Valley, January 11, 2018 - photo courtesy Joe Naccache. To me, this was one of the highlights of my many photographic journeys all over the world, an occasion that comes along every so often that I am eternally grateful for. I am constantly reminded of the never ending beauty of our home planet, Earth, so let us all be grateful and ensure we do everything possible to keep it that way, so it gets passed on to all of the many generations of fellow human beings to follow!